Twice now, the user documentation has unpublished on secure. In this state, bin/diviner generate --book ... reports that the documentation is published, and bin/diviner generate --book ... --clean fixes the issue. Neither Diviner nor the cronjob driving documentation generation have been touched in a long time, so this is a bit mystifying at first glance. The "Contributor Introduction" document, specifically, seems to have unpublished. Let me see what I can dig up about the current database state. So this isn't new behavior, and presumably nothing about the "User" book is unique. summary: Guide to adding new classes to extend Phabricator. summary: Explains how to add new CSS and JS files to Phabricator. summary: Information about making Phabricator accessible to assistive technologies. summary: Describes how to file an effective Phabricator bug report. summary: Describes the Contributor License Agreement (CLA). summary: Introduction to contributing to Phabricator, Arcanist and libphutil. summary: Describes how to contribute code to Phabricator. summary: This document describes CSS features and coding standards for Phabricator. summary: Enabling and using the built-in debugging console. questions like how to store new types of data. summary: Explains how to describe a root problem effectively. 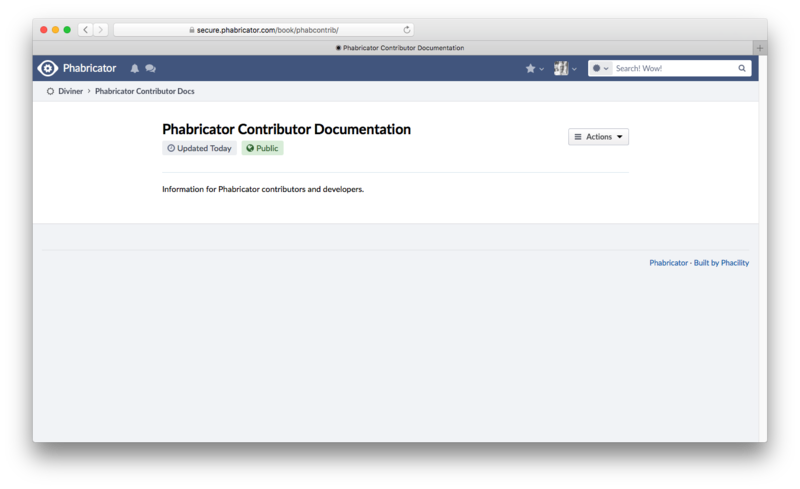 summary: How to configure a Phabricator development environment. summary: Describes how to file an effective Phabricator feature request. summary: Describes how to install XHProf, a PHP profiling tool. summary: Describes Phabricator translation and localization. summary: How to avoid a common performance pitfall. application class and subdirectory organization best practices. projects (like Arcanist and libphutil). summary: Rendering HTML in the Phabricator environment. summary: Describes how to provide reproduction steps. summary: Simple guide to libphutil, Arcanist and Phabricator unit tests. summary: Guide to the Edges infrastructure. summary: How to use the Phabricator OAuth Server. summary: How to provide version information with reports made to the upstream. summary: This document contains instructions for keeping Phabricator up to date. But note that the graphHash and nodeHash columns are 0, which I believe is a signal that these nodes have been deleted (I haven't touched this code in a while). This looks right from the code. So, so far it looks like the database is in a "good" state but the publish workflow incorrectly deleted all the articles. From previous efforts, I believe dropping the cache fixes this issue. Found 8,262 files in project. Found 8,237 unatomized, uncached files. Found 0 files to atomize. Atom cache is up to date, no files to atomize. Found 0 obsolete atoms in graph. Found 0 new atoms in graph. Propagating changes through the graph. I'll dig into what atomization is doing in more detail. DivinerPublisher->publishAtoms() is being passed nothing, so it's correctly deleting everything. The graph cache is empty. The actual atom.cache file on disk is empty. The input to the cache is empty. The files aren't being passed to the atomizer rules (although the rules appear to be applying correctly). The file cache says that these files have already been parsed and contain no atoms, so the rest of the program behavior is expected after that. I'm not sure how this state came to exist. The file was owned by root:root. This is in a different book, but maybe there's a race or sequencing issue with the cache writes? Feels like a long shot. It looks like some of this may be entagled with root having generated documentation at some point (this unlink is failing because the file is owned by root + root), plus poor recovery from ownership issues. Pretty sure this still isn't actually fixed. This cropped up again and the permissions error also resurfaced, even though I previously nuked the directory. I think the root cause of this is actually just very mundane: we have the crontab installed for both users root and ubuntu. We must then have some poor error recovery behavior in the presence of root-owned cache files. I removed the root copy of the crontab and am rebuilding the documentation now. The immediate issue now appears fixed and it seems likely that the root cause is also fixed. We should still hunt down the bad cache behavior in the presence of wonky permissions. epriestley lowered the priority of this task from Normal to Low.